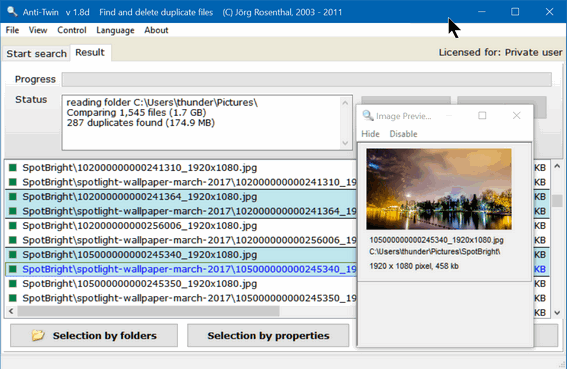 After years of trying and rejecting all kinds of duplicate file finders, either because they were distributed with garbageware, bundled with malware, or were too aggressive thus leaving reeling users with tears rolling down their faces because the files that some duplicate file finders found were not dupes at all, we have finally found a duplicate file finder we can recommend. Now, that does not mean you can throw caution to the wind and delete every file that might be a duplicate. You still have to exercise good judgment. But Anti-Twin does a great job of finding duplicate files and then letting you compare the duplicates so you can make an informed decision it the duplicate is really a duplicate and if you want to delete it. Anti-Twin is the fastest, coolest, safest (when used according to directions and with reasonable care) free duplicate file finder this side of Mars. I can’t tell you what’s beyond Mars, but I have a feeling I might find out someday, if EB’s size 10 boot ever finds my posterior. Anyway — Anti-Twin is a small (less than one megabyte) program that will find duplicate files in any folder and help you eliminate the mess that duplicates cause. Plus Anti-Twin compares files in all sorts of ways to ensure the files are really duplicates. You sure don’t want to delete aunt Emily by accident. Anti-Twin is a small software application which compares files, i.e. it searches for duplicate or similar files on your hard disk drive. All similar or identical files that were found can either be sent to the recycle bin or directly deleted. This will increase the hard disk space on your computer. Anti-Twin is an excellent application to e.g. find and delete duplicate MP3 files in a download folder or to find similar images. Apart from that, Anti-Twin helps you clean up employees’ chaotic file repositories in company networks, e.g. by searching for unnecessary file copies and redundant data back-ups. Anti-Twin is freeware and can be downloaded from the Download page…. Please also read the instructions and note the warnings. Well he summed it up right, didn’t he? Above: The Anti-Twin program interface. A little dated, but still intuitive. 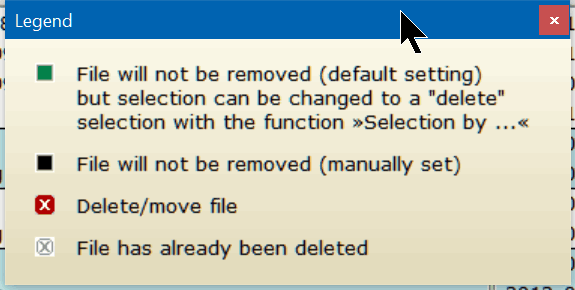 Above: Default setting in Anti-Twin makes sure suspected duplicates are not deleted without your review. You get the final say… but only if you leave the default setting alone. Above: Some duplicate images found in my Pictures folder. Note by clicking on each duplicate I can compare the images, images sizes, and type… and be absolutely certain they’re duplicates. You can read more about and / or download Anti-Twin from http://www.joerg-rosenthal.com/en/antitwin/ . You can download it with an installer, just the executable, or as a zip file. All are under 1 MB, so we recommend you download the installer because we think you’re really going to like Anti-Twin. All files are clean and green – free from any garbage, tricks or malware. Oh, and one more thing: Please do as Jörg says: Take a moment to read the instructions and the warnings. It’s easy enough to use you’ll be tempted to skip the instructions, which means you’ll be tempted to skip the warnings. Please don’t.